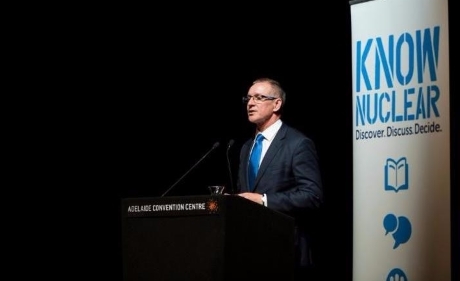 The government of South Australia will support nine of the 12 recommendations of a Royal Commission on the nuclear fuel cycle, Premier Jay Weatherill announced today. These include the expansion of uranium mining and exploration, but not the removal of existing prohibitions on nuclear power generation. The Nuclear Fuel Cycle Royal Commission was launched in March 2015 to undertake an independent and comprehensive investigation into the potential for increasing the state's participation in the nuclear fuel cycle. Weatherill today delivered to the state parliament the government's formal response to commission's report, which was published in May. The commission made five recommendations related to uranium exploration and mining, all of which the government has decided to support. This support means, Weatherill said, that a new state-wide mineral exploration drilling initiative can be developed to support the discovery of new deposits in South Australia, with a particular focus on uranium. These five recommendations the government supports are: the simplification of state and federal mining approval requirements for radioactive ores, to deliver a single assessment and approvals process; to further enhance the integration and public availability of pre-competitive geophysical data in South Australia; to undertake further geophysical surveys in priority areas, where mineral prospectivity is high and available data is limited; increased long-term investment in programs to encourage and support industry investment in the exploration of greenfield locations; and to ensure the full costs of decommissioning and remediation with respect to radioactive ore mining projects are secured in advance from miners through associated guarantees. The government also supported the commission’s recommendations to collaborate at the national level on the development of a comprehensive national energy policy that enables all technologies, including nuclear, to contribute to a low-carbon energy system, and to monitor the development of new nuclear reactor designs. It also supported a recommendation to promote and increase the use of nuclear medicine at the South Australian Health and Medical Research Institute. It did not support the commission's recommendation that it should pursue the removal of existing prohibitions on nuclear power generation in the state, "recognising that in the short-to-medium term, nuclear power is not a cost-effective source of low-carbon electricity for South Australia." Weatherill said the government would not "pursue policy or legislative change" relating to a nuclear waste storage facility in the state but would "continue to encourage" discussion on the issue and "remain open to pursuing this opportunity for South Australia." A potential waste facility was the subject of two recommendations by the commission. The government said it would support continued investigation into the recommendation to pursue the opportunity to establish used nuclear fuel and intermediate level waste storage and disposal facilities in South Australia, but would not support the recommendation to remove related legislative constraints. Yesterday, Weatherill announced plans for a referendum after a Citizens' Jury rejected proposals that South Australia should store and dispose of nuclear waste. Today, he said the government had concluded the restoration of bipartisanship and broad social consent secured through a state-wide referendum was "the only path forward".